I think it’s fair to say that I’m obsessed with workout clothes. A long time ago I used to exercise in old t-shirts and shorts, but now I have a huge wardrobe of specialized gear. At some point in the last few years my running/gym items have taken over not only the largest drawer in my dresser, but also three full boxes under my bed. I only realized the extent of my collection just now as I was tallying that amount up in my head. I’ll admit that it’s beyond ridiculous. But even the reality that I’m rapidly running out of room for all of my fitness apparel doesn’t mean I stop shopping for more. Even when I wasn’t exercising much in January I was still browsing for workout clothes online. It was basically the epitome of retail therapy – boxes of shirts and pants that, given my situation, were the opposite of practical arrived at my door and that made me happy. Even if I wasn’t wearing them for their intended purpose! Luckily things have started to turn around in that department. For the last five weeks I have been going to boot camp classes with my running buddy three times a week fairly regularly (except the week I was on a whirlwind business trip – more on that in another post) so my new workout clothes have been getting more use. (And my poor muscle have also been getting more use. Ouch!) So far I’ve fooled two of the trainers at the gym on multiple occasions with the INKnBURN denim capris I ordered in January. They are fantastic! Super comfortable, stretchy, and made of fabric that’s designed to look exactly like jeans – back pockets, embellishments, belt loops, button fly, and all. Who says you can’t be stylish while exercising? And they have the added benefit of being respectable enough to wear running errands as well. So the INKnBURN pants were a choice well made. That’s certainly not true of all of my retail therapy purchases, but that’s a story for another day. P.S. 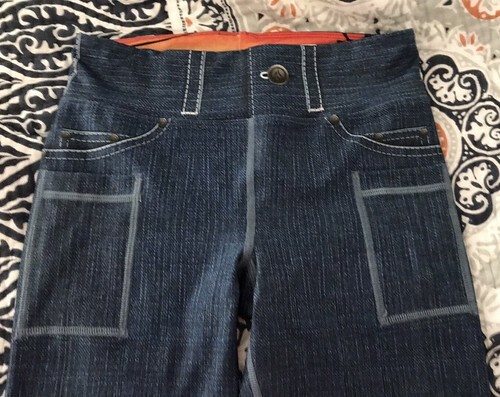 I bought these denim capris in two different sizes – one pair I can wear now, and a smaller pair for when I start meeting my fitness/weight loss goals! Something to look forward to.